Christie’s Amsterdam, Liechtenstein: Property from the Collection of the Princely House of Liechtenstein, 1 April 2008, lot 129. Meisterwerke aus den Sammlungen des Fürsten von Liechtenstein, Kunstmuseum Luzern, 1948, cat. no. 230. Fanti, Descrizzione completa di tutto ciò che ritrovasi nella galleria di pittura e scultura di Sua Altezza Giuseppe Wenceslao del S.R.I. Principe Regnante della casa di Lichtenstein, Wien, 1767, p. 36, no. 17. Dallinger, Description des Tableaux, et des Pièces de Sculpture, que renferme la Gallerie de son Altesse Frangois Joseph Chef et Prince Regnant de la Maison de Liechtenstein, Wien, 1780, p. 259, no. 32. Tietze-Conrat, “Die Bronzen der fürstlich Liechtensteinischen Kunstkammer”, in Jahrbuch des kunsthistorischen Institutes der k. k. Zentralkommission für Denkmalpflege, XI (1917), p. 94, fig. 74 (illustrated). Wilhelm, Meisterwerke aus den Sammlungen des Fürsten von Liechtenstein, Luzern, 1948, p. 54, no. 230. Planiscig, Die Bronzeplastiken. Statuetten, Reliefs, Geräte und Plaketten, Wien, 1924, nos. 241-246. Placchette e bronzi nelle civiche collezioni di Ferrara, Ferrara, 1974, cat. No. 151. 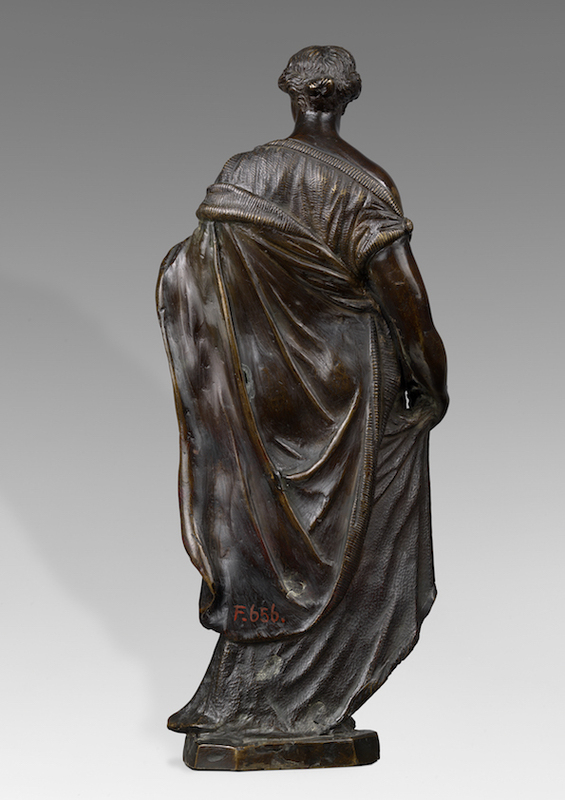 D. Wixom, Renaissance Bronzes from Ohio Collections, Cleveland, 1975, cat. 154, pp. Stedman Sheard, Antiquity in the Renaissance, exh. cat, Northampton, Massachussetts, 1978, cat. 24. The monumental Flora Farnesewas discovered in Rome before 1532,1and soon entered the Farnese collection, remaining in the family’s palazzo until the late 18thcentury, when it was removed to Naples, where it remains in the Museo Archeologico Nazionale. The head, part of the neck and the right arm as well as the left forearm were missing from the Roman marble, and were restored by Guglielmo della Porta (c. 1500-1577) around 1555.2The sculptor thus effectively “created” theFloraby adding a flower garland held in the left hand.3A pen and brush drawing, probably by Nicolas Poussin, in the Rijksmuseum Amsterdam, gives a fair idea of what the sculpture would have looked like in the early 17thcentury (fig. 1). 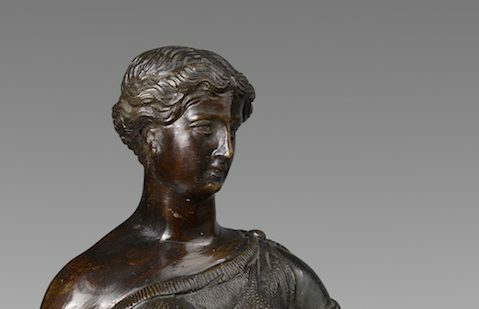 The present bronze, however, belongs to an earlier series, generally dated as Florentine, second half 16thcentury. Very few examples are known, all showing a lesser degree of invention than is seen on the present one, all depicting the goddess holding a flower garland and barefoot. A first version is in a private American collection, a second one in the Bargello, Florence, a third one in the Museo Riminaldi, Ferrara and, lastly, a fourth one in the Kunsthistorisches Museum, Vienna (fig. 2, currently as Roman). In her seminal essay on the Liechtenstein Kunstkammer, Tietze-Conrat catalogues our bronze – documented in the Princely Liechtenstein Collection from at least 17675– as Florentine, circa 1600. Several points differentiate this Florafrom the above-mentioned examples. The clinging drapery is highlighted by a powerful matt punching, giving a textured finish to the surface. In her left hand, which unlike in the marble restored by Della Porta turns towards her body, she holds a cornucopia of flowers, an artistic licence that differs from both the garland of the 16thcentury restoration, and Albacini’s nosegay which can still be admired today. Moreover, the goddess is not barefoot but wears elegantcalzari. Elements such as the casting and after-work on the present sculpture, which effectively make it unique amongst the series, point instead to a probable Roman origin. The great immediacy given to the figure by the quick sketching, but also the punching of the vest, recall figures and techniques employed by Guglielmo della Porta and workshop (see, for instance, the reliefs on the Funeral monument of pope Sixtus IV, St Peter’s Cathedral, Vatican City), whose influence was still largely felt in the first years of the 17thcentury. 1See a drawing by Maarten van Heemskerck, 1532-36, reproduced in C. Hülsen, H. Egger, Die Römischen Skizzenbücher von Marten van Heemskerck im Königlichen Kupferstichkabinett zu Berlin,2 vols, Berlin, 1913-16, I, pp. 33-34, fol. 62v, where the Floraappears without repairs. 2Cf. R. Frederiksen, E. Marchand (eds. ), Plaster Casts: Making, Collecting and Displaying from Classical Antiquity to the Present, Berlin-New York, 2010, p. 396, note 19. 3Around 1800, Carlo Albacini transformed the sculpture replacing the right arm and the left forearm, which now holds a bunch of flowers. 4Cf. Stedman Sheard, op. cit., cat. 24. 5Cf. V. Fanti, op. cit., p. 17. Wilhelm (op. cit., p. 54), mentions the sculpture as first recorded in the collection in 1658. However, the piece is absent from that year’s Guardarobainventory of Prince Karl Eusebius (cf. H. Haupt, Von der Leidenschaft zum Schönen. Fürst Karl Eusebius von Liechtenstein (1611-1684), Köln-Weimar, 1998, pp. 357-79. The author wishes to thank Dr Arthur Stoegmann of the Liechtenstein Collections Archives in Vienna for this information. Fig. 1: Attributed to Nicolas Poussin, Flora Farnese, Rijksmuseum Amsterdam. Fig. 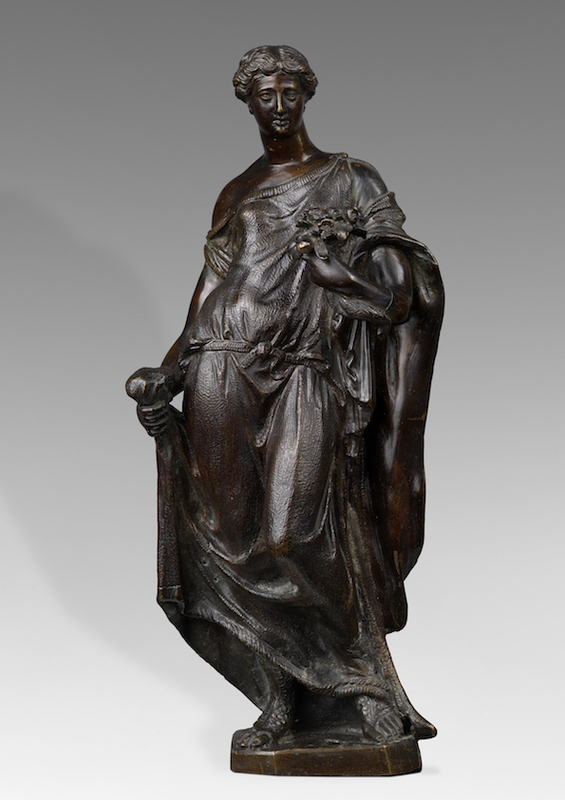 2: Roman, Flora Farnese, late 15thcentury, bronze, 40.5 cm high, Kunsthistorisches Museum, Vienna.